Learn about relationships, communication skills, cooperation, and resolving conflict non-violently through experiential learning. Gain strategies and skills that will enhance your personal and professional relationships. Add fun and meaningful violence prevention activities to your trauma/resilience toolbox. Led by Sue Stephenson, MD; Barbara Babin; and David Beckman, all AVP facilitators trained in trauma awareness. 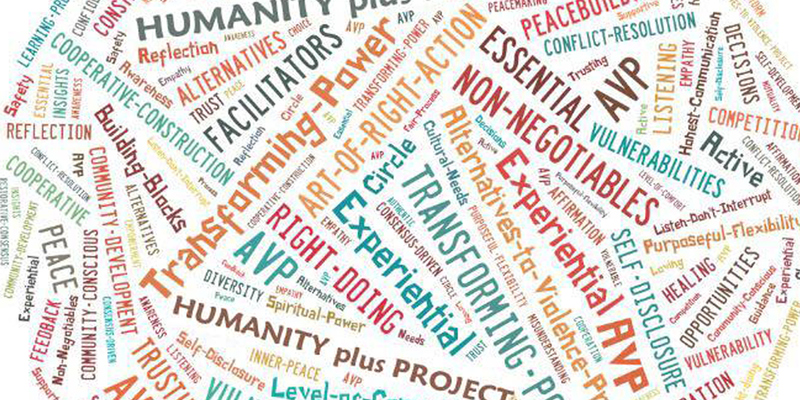 The Alternatives to Violence Project (AVP) began at Green Haven Prison in New York in 1975. It is now present and active in more than 35 States and more than 50 countries worldwide. Workshops are being held in prisons and a wide variety of other community and institutional settings. Hanna Institute courses are approved for continuing education credit for a variety of professionals. See details.